Real Madrid will host Barcelona in the second leg of the semi-final at the Santiago Bernabeu Stadium in Madrid on Wednesday. 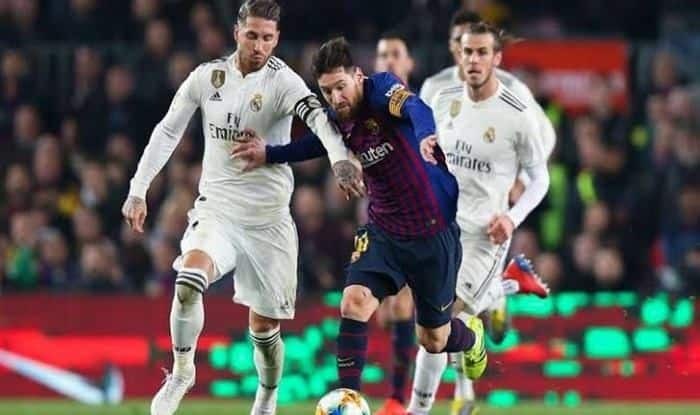 Following a one-all draw in the first leg of the Copa Del Rey Semis, Real Madrid will now host Barcelona in the second leg of the semi-final at the Santiago Bernabeu Stadium in Madrid on Wednesday. In the reverse fixture which was held at the Camp Nou stadium, Lucas Vazquez scored the opener in the sixth-minute following which Malcolm found the back of the net to equalise for the Catalan club. Pressure is now mounting on the defending European champions Real Madrid, who recently suffered a 2-1 shock defeat at home to minnows Girona and scrambled a late victory against Levante on Sunday in a match which drew much controversy. The ‘Los Blancos’ have won this competition just once since 1993, and a win against Barcelona could potentially change their fortunes for the season to come. The Santiago Solari-led could still have a positive season if they go on to clinch the Copa Del Rey. They are also still in contention in the Champions League.